If you're looking to indulge/over-indulge on sweet icy slush this week, 7-Eleven will once again be running a Bring Your Own Cup deal, where you can bring a bucket or any "cup" of your choice and fill it up for $1.50 this Friday and Saturday. The deal is good on August 19 and 20, 2016, from 11 AM to 7 PM at participating locations. $1.50 is the average cost of a medium Slurpee. Your "cup" can be any container that fits upright through an in-store display with a 10-inch diameter hole but must be leak-proof-safe, and sanitary. Trashcans, trash bags, kiddy pools, and kitchen sinks are specifically excluded. 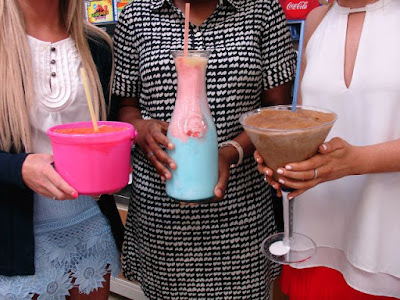 In case, you don't have anything handy (or clean) lying around, 7-Eleven has 32-oz Slurpee fishbowls for $3.99, while supplies last. This marks the second time this year that 7-Eleven has run this promotion, which the company has also held in Australia, Canada, the Philippines, and Malaysia in the past.